BlackBerry® smartphones excel when it comes to working with large amounts of e-mail. Many of the new models feature a trackball which can be used to navigate and select items. 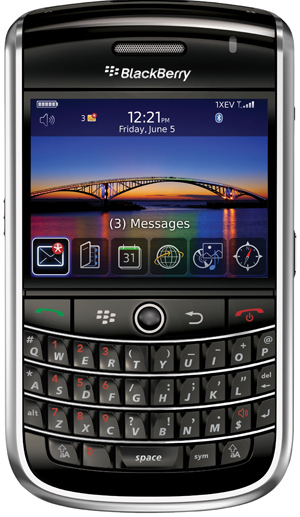 Because the BlackBerry smartphone is a telephone, it ships configured to allow easy dialing from the Home screen. To dial from the Home screen, press the number keys and then press Send or the Enter key. For BlackBerry smartphones with physical QWERTY keyboards, this “Home screen” functionality makes tapping in a phone number a snap — or more precisely, a tap. 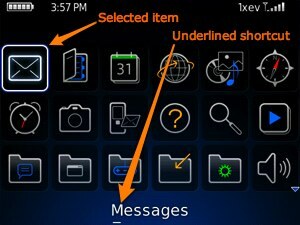 However, disabling Home screen dialing will enable Home screen shortcuts for many of the built-in BlackBerry apps. Shortcuts on the Home screen can help reduce scrolling. Press the Send key to launch the BlackBerry Phone application. Press the Menu key, then click Options. Set Dial From Home Screen to No. Press the Menu key, then click Save. With “Dial From Home Screen” disabled, a number of Home screen shortcuts become active. Shortcuts like “A” for Address Book, “M” for Messages, and “O” for Options, are just a few. BlackBerry®, RIM®, Research In Motion®, SureType®, SurePress™ and related trademarks, names and logos are the property of Research In Motion Limited and are registered and/or used in the U.S. and countries around the world.